In August of 1830, Joseph discovered that a man named Hiram Page had used a stone to receive two revelations on behalf of the entire Church. Joseph was surprised to find that so many people believed Page’s supposed revelations and enquired of the Lord concerning the issue. The response confirmed that “no one shall be appointed to receive commandments and revelations in this church excepting my servant Joseph Smith, Jun.” (Doctrine and Covenants 28:2). Yet people consistently listened to others rather than the prophet. Eventually, the Lord had to warn the church to “beware of pride, lest ye become as the Nephites of old” (Doctrine and Covenants 38:39). This warning was likely an uncomfortable one for the early Saints, as becoming as the Nephites of old would mean complete destruction. Yet failure to listen to the prophet was exactly the reason the Nephites were destroyed. One example of this is the failure of the people to listen to Samuel the Lamanite. He had told them, for example, that “four hundred years pass not away save… heavy destruction… cometh unto this people, and nothing can save this people save it be repentance and faith on the Lord Jesus Christ” (Helaman 13:5–6, emphasis added). Four hundred years later, as destruction was falling on the people, they apparently had not listened, as Mormon stated that the people no longer had any faith (Moroni 8:14). Samuel told the Nephites that if they continued to care more about their riches than about the poor, the Lord would “curseth your riches, that they become slippery, that ye cannot hold them” (Helaman 13:31, emphasis added). This kind of economic havoc is exactly what took place near the end: “the inhabitants thereof began to hide up their treasures in the earth; and they became slippery, because the Lord had cursed the land” (Mormon 1:18, emphasis added). Samuel said this would happen “because of the hardness of the hearts of the people of the Nephites” (Helaman 13:8, emphasis added) if they did not repent. Apparently they reverted to this hardened state, as Mormon stated that the Lord cursed them “because of the hardness of their hearts… even unto the fulfilling of all the words of Samuel the Lamanite” (Mormon 1:17–19, emphasis added). Samuel also said that the Spirit of the Lord would be withdrawn from them, and they would be visited with sword and famine (Helaman 13:8–9). It happened just as he said. The Spirit withdrew (Mormon 2:26), and they were visited with sword (Mormon 6:15) and famine (Moroni 9:16). Samuel summed up the issue well by using the Lord’s own words, “If they will not repent, and observe to do my will, I will utterly destroy them, saith the Lord, because of their unbelief notwithstanding the many mighty works which I have done among them” (Helaman 15:17, emphasis added). Mormon said the same thing in a letter to his son Moroni. He said he thought his son might live to witness the “utter destruction” of the Nephites: “for I know that they must perish except they repent and return unto him” (Moroni 9:22, emphasis added). The Book of Mormon demonstrates the same pattern: refusing to listen to the prophet will eventually lead to destruction. The implications of this doctrine for today are uncomfortably obvious: modern readers are not immune from the destruction that often attends disobedience to the prophets. Samuel the Lamanite told the people exactly what they needed to do to succeed and exactly what would happen if they disobeyed. Mormon made it clear that when the Nephites failed to listen to Samuel, they experienced the precise consequences Samuel warned them about. People today can expect nothing different, as the Lord has said, “If my people shall sow filthiness they shall reap the east wind, which bringeth immediate destruction” (Mosiah 7:31). in our case, as in the case of the Nephites, we have had opportunity to know for many years not only that great destructions will occur, but also why. Knowing what we know, is it possible that some in our day who have the truth will dwindle in unbelief, like the Nephites, and become so wicked that they will be destroyed? Jeffrey G. Cannon, “All Things Must Be Done in Order,” in Revelations in Context: The Stories Behind the Sections of the Doctrine and Covenants, ed. Matthew McBride and James Goldberg (Salt Lake City, UT: The Church of Jesus Christ of Latter-day Saints, 2016), 50–53. Janiece Johnson and Jennifer Reeder, The Witness of Women: Firsthand Experiences and Testimonies from the Restoration (Salt Lake City, UT: Deseret Book, 2016), 143–153. Gerald Hansen, Jr., “The Terrifying Book of Helaman,” in Helaman through 3 Nephi 8, According to Thy Word, The Book of Mormon Symposium Series, Volume 7, ed. Monte S. Nyman and Charles D. Tate Jr. (Provo, UT: Religious Studies Center, Brigham Young University, 1992), 163–176. Jeffrey G. Cannon, “All Things Must Be Done in Order,” in Revelations in Context: The Stories Behind the Sections of the Doctrine and Covenants, ed. Matthew McBride and James Goldberg (Salt Lake City, UT: The Church of Jesus Christ of Latter-day Saints, 2016), 50. Although this warning directly applies to the people not taking care of the poor, this was, and is, such a consistent prophetic directive that the two ideas can be seen as being directly related in this section. Book of Mormon Central, “How Did Mormon React to Seeing His People Slain? (Mormon 6:17),” KnoWhy 232 (November 16, 2016). One unsettling similarity between the Book of Mormon and the trouble with Hyram Page is that Korihor had sought to usurp power away from the church and its leaders because of his false revelation. In Alma 30:53 he stated, “But behold, the devil hath deceived me; for he appeared unto me in the form of an angel, and said unto me: Go and reclaim this people, for they have all gone astray after an unknown God.” Listening to people like Korihor and not listening to the prophets eventually led to the destruction of the Nephites. For more information on why Samuel would have given the exact figure of 400 years, see Book of Mormon Central, “Why Did Samuel Make Such Chronologically Precise Prophecies? (Helaman 13:5),” KnoWhy 184 (September 9, 2016). For insights on what this might have meant to Mormon, see Phyllis Ann Roundy, “Mormon” in Encyclopedia of Mormonism, 4 vols., ed. Daniel H. Ludlow (New York, NY: Macmillan, 1992), 2:932–933. Brant A. Gardner, Second Witness: Analytical and Contextual Commentary on the Book of Mormon, 6 vols. (Salt Lake City, UT: Greg Kofford Books, 2007), 6:54–56. 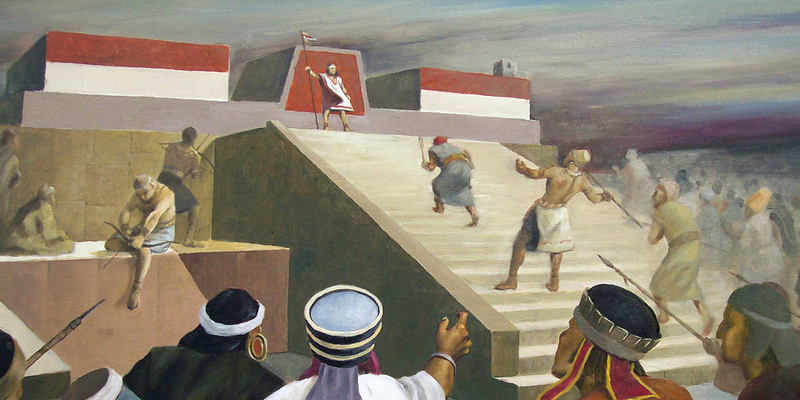 Mormon 2:10 contains another explicit reference to the words of Samuel the Lamanite being fulfilled in Mormon’s time, and there is at least a remote possibility that Mormon saw a warning by Samuel about being “surrounded by demons” (Helaman 13:37), as being fulfilled by the Nephite practice of magic and witchcraft. See Joseph Fielding McConkie and Robert L. Millet, Doctrinal Commentary on the Book of Mormon, 4 vols. (Salt Lake City, UT: Bookcraft, 1987), 3:407. Book of Mormon Central, “How Could So Many People Have Died at the Battle of Cumorah? (Mormon 6:14),” KnoWhy 231 (November 15, 2016). Hugh Nibley, The Prophetic Book of Mormon, The Collected Works Hugh Nibley, Volume 8 (Salt Lake City and Provo, UT: Deseret Book and FARMS, 1989), 285. Dennis L. Largey, “Samuel2 the Lamanite,” in Book of Mormon Reference Companion, ed. Dennis L. Largey (Salt Lake City, UT: Deseret Book, 2003), 698. For an overview of the fall of the Nephites, see Thomas W. Mackay, “Mormon and the Destruction of Nephite Civilization (Mormon 3–9),” in Book of Mormon, Part 2: Alma 30 to Moroni, Studies in Scripture, Volume 8, ed. Kent P. Jackson (Salt Lake City, UT: Deseret Book, 1988), 231–244. Gerald Hansen, Jr., “The Terrifying Book of Helaman,” in Helaman through 3 Nephi 8, According to Thy Word, The Book of Mormon Symposium Series, Volume 7, ed. Monte S. Nyman and Charles D. Tate Jr. (Provo, UT: Religious Studies Center, Brigham Young University, 1992), 165. Where in the Book of Mormon does it describe the concrete or stone structures that are depicted in the picture?